Everything is changing for Becket Branch. From subways to sidewalks to safety rules, Becket is a city kid born and raised. Now the Branch family is trading urban bustle for big green fields and moving to Gran's farm, where Becket has to make sense of new routines from feeding animals to baling hay. And as much as Becket loves to yell "Beautiful Alert!" there's a lot about the countryside that is just plain odd. But Becket is ready to put her own spin on country life. Whether selling her mouth-puckering lemonade, feeding hostile hens, or trying to make a best friend of her new neighbour Frieda Franca, Becket is determined to use her city smarts to get a grip on farm living. 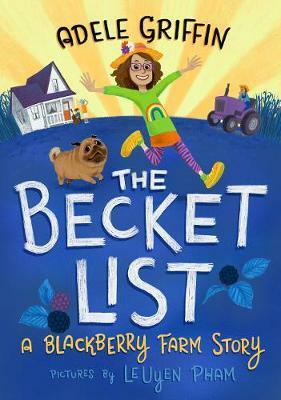 Laugh and learn with Becket as she mucks through the messy, exuberant human experience of change she didn't ask for, in a story that sparkles with quirky characters and lasting connections. "This is not just a terrific book about sharing friends with siblings, rolling with changes, and the difficulty of making new friends after a move. It is also (spoiler alert) a terrific, gentle, earnest book for coping with pet loss . . . [Griffin's] humor, pathos, quick character development, and enjoyable dialogue are just as good as ever, and Pham's illustrations . . . are charming and beautifully humorous in how they capture emotional expression. A sparkling story of weathering change." "Becket is an outgoing, refreshingly self-confident protagonist . . . Readers will appreciate her ability to bounce back from whatever life hands her. Pham's sketch drawings scattered throughout enhance the energy and humor of the story. Give this to kids who enjoy stories with plucky female protagonists." "Becket is a regular laundry list of confidently delivered safety sayings, and it's just one of her many original and sparkling traits . . . the storyline is warm and amusing as Becket and her two siblings navigate their new life on a farm." "An enjoyable novel for young readers beginning to explore the world on their own terms." "Becket's narration vibrates with energy and cheer...Pham's black and white illustrations...have just the right amount of comic flair to match the vibrant humor of Becket's story." Adele Griffin is the National Book Award-nominated author of numerous books for middle grade and young adult readers, including the popular Oodlethunks, Witch Twins, and Vampire Island series. She lives in Brooklyn, New York, with her husband and two children. LeUyen Pham worked in animation before turning to children's books. She is the illustrator of the Princess in Black series, Real Friends, the Freckleface Strawberry series, and many other books for young readers. She lives in San Francisco with her husband and two sons.